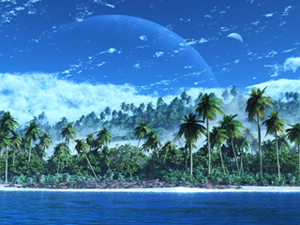 I set out in this piece to update "Atoll" from 2002 using Vue's new water rendering engine. Unfortunately the clouds and fog that I added to the island itself caused Vue d'Esprit all sort of trouble during the final render. The final render took far longer to produce that I am happy with. There are still some elements in this piece that I would like to fix up but that will have to wait until I have added more renderers to my stable. On the dual screen of this wallpaper, does anybody else have the planet cut off then restart at a different angle? The watermark on the 3840x1080 is over on the right now. I get my happy points for promoting DB with the words tastefully displayed on the corner. Sometimes it really is the little things. And by the way, excellent work AGAIN. Wish I was there! I see you are still getting barrel distortion on the wide angle shots. When the heck is Vue going to fix that??? I'll agree with the 'water' comment below... If you could tweek at all. However, just the same... If is my desktop!!! And when you think of the 'inspiration' for the rendering... It's a beautiful thing. Keep it up. Few of us get to work from home, surrounded by family, being paid for exactly what we enjoy doing. You Da! "Water still doesn't look right"
It looks good til you get to the water, but the water doesn't 'look' like water. If you compare this to an earlier work, Oasis (which was done in 1999), the water in it looks 'real' compared to this one. I really don't blame Ryan for this as much as I do his rendering program...I think, as some others have said before me, it's time to look for a new rendering program. Not to worry... It's all good! I like it just the same, and am awaiting multi-screens, and night versions. I envisioned this one being the same moon as represented in The Fisherman. As with that piece the gas giant is pretty large in the sky so there just isn't room for rings. Apart from that, I also find the new version a lot better. Let's see how the night version comes! Very, very nice... Actually, Awesome!!! Patiently waiting for the multi-screen!!! Keep it up your Awesome Dudeness! Yes! Better! Love it! Night version! agreed, the new version looks better. @zero "clouds" yet, clouds like that aren't completely unusual in the real world. That tree in the center looks...off. Almost cartoony. I love this new version alot better. Less of an eerie, distant shoreline and more of a calm, inviting one. I'm not sure if you can still say the first one was worth the wait since this one came out so much quicker. Nicely done. Looks much better than the first one! Great to know it was something you could fix! "@Ryan RE: "@RC and @Nelson" "
What about other software alternatives like Blender (blender.org) or something simular? I have seen you post comments on trying out other software but all the software I recall costs. Personally, I am a firm believer in spending my money on hardware and getting the software for free. Thanks! Glad you were able to figure out a good tweak. Version two looking a lot better, I look forward to the multiscreens. There's still a little grain in the water but it's nowhere near as noticeable, and the trees, clouds and mist look nice and smooth. I am glad that you were able to find the reason for the long renders. Keep up the good work! Ryan - Your a true artist my man. It looks cold though. If you ever see this or whatever please consider for a moment making something warm and peaceful for the summertime. All the best brother. "I wish this place existed!" Im not having any problem rendering(macs for the win!) and i have to say im quite impresses. keep up the good work ryan! There is no PC powerful enough to render Ryan's imagination. I spent quite a few hours yesterday tearing down this scene and rebuilding it to render faster. After much experimentation I discovered that the real culprit behind the rendering issues was not the clouds or the vegetation. It turns out the "procedural" terrain meshes I used for the atoll itself were to blame. I replaced them with "standard" terrain meshes and now it seems to render as expected. Unfortunately this also meant redoing the vegetation along the shoreline. The new render won't look exactly like the first version, but I should be able to create multiscreens and maybe even a night/dusk version that will render in a reasonable timeframe. Just to make it clear: I don't mind waiting weeks for a new work from Ryan because of long render times. This is not the problem. As Ryan said, it's just frustrating for the artist to work in such a way. Clearly, something has to be done about that. A few people have given some interesting suggestions, maybe it's really worth trying something new out? 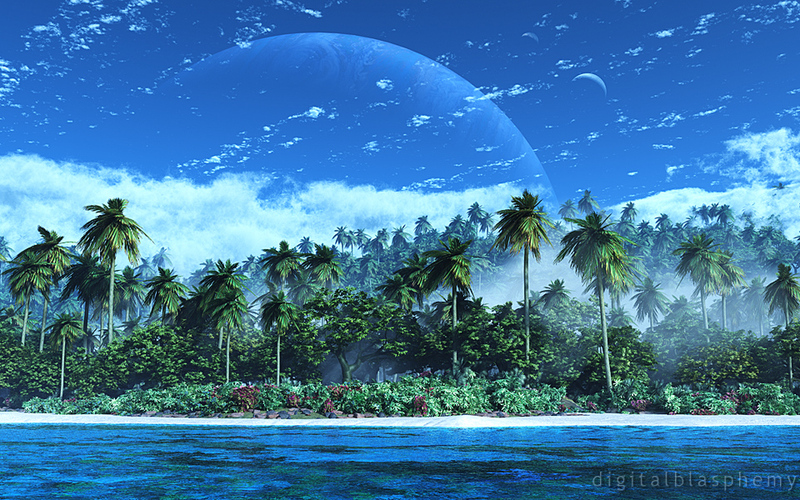 Daz 3d has a program called Bryce that is used to create natural landscapes. Daz is currently having a 100% sale so you could get Bryce 7 for free. I dont know how it compares to Vue, but I suppose it could be an option. I agree with Louise. This one looks great, and was well worth some extra render time - and the clouds and fog that took so long are what really set it apart for me. I hope you'll continue making the art that you want to make, not the art that will render quickly. Certainly I can see that it would be frustrating to have to wait for such long rendering times, and maybe different software or using a render farm are options worth looking into (I don't know because I don't know what other options are out there). But I'll gladly wait a few extra days for the kind of high quality, detail-filled images you make (and to have them without grain). Ryan... I totally hear you on the Vue problems. For such a powerful program, they really pack a terrible renderer. It seems there's more than a little outcry over it's performance issues... so hopefully they're actively addressing them. I'm wouldn't normally plug a company in a forum like this, and I have no association with RanchComputing other than as a customer, but it's saved me tons of render time. The prices are reasonable, the farm is powerful, and the process is really simple. Just something to consider. I know you've mentioned in the past that you're on a not-so-fast internet connection, but if you tell Vue to pack & compress your scene before uploading it to the render server... I've found the file sizes to be not-unreasonable. NOTE: I never use compression while working a project because of the increased save-times and increased possibility of data corruption. It may have taken a long long time, but this one is just stunning; between the mist rising over the trees on the island and the clouds above them the sense of depth is just amazing, almost 3D. Already one of my favorites! "Time for a new program?" I know that you have done some amazing work in other programs. Perhaps it is time to put Vue to bed for a while and focus on something that doesn't tie up your machines for endless days. Weeks of rendering must be very frustrating for you. Have you told Vue's devs about your problems? 24 hours for one pixel - there's something seriously wrong there. My thoughts on the time vs quality issue: Graininess bad (it makes your art lose its photographic quality). I don't mind waiting a bit longer to avoid graininess. But I'm thinking that more beautiful does not necessarily have to mean more complicated. Maybe less 'busy' nature pieces with soft light and deep view distance could be very beautiful but less demanding on the tech. Ryan, have you considered funding a render farm using Kickstarter or another crowd funding site? I'm sure long time members would be happy to contribute, and you could offer rewards like signed prints and exclusive renders. I am inclined to think you should do as you think best, but if pressed upon to offer counsel would suggest you go for the best finished result you can produce, the best approximation in reality of the vision in your mind; rather than whatever will render faster. Especially in those cases where we already have a version available, the updates reflect your growing artistry but also the improving technology, why not take full advantage of it? Its not as though your members have any shortage of wallpapers while we wait for the newest one. Render times are becoming a major issue and there are a number of reasons for it. You've correctly noted a number of them (higher resolutions and more details). I think there's more to it though. I think Vue is suffering from increasing bloat and is not using resources efficiently. It also does a terrible job of estimating how long the render has to complete. Vue will do a "preview" render in mere minutes but will churn endlessly when you set it going with production quality settings. The "estimated time" remaining will say 24 hours for days on end. 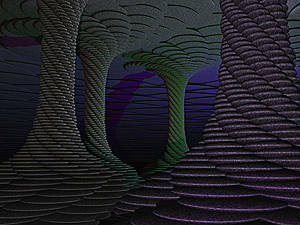 Given that I have already done all of the work creating a scene that I think will look great I am loathe to stop it halfway (after many hours of wasted rendering) to reconfigure everything (especially when there is no way of knowing whether or not I have made any difference in the render time). Hitting the render button has turned into something of a crapshoot. I really have no idea how long these things will take to finish. If I dial back the render quality (so they finish sooner) then the dreaded "grain" creeps in that everyone seems to hate. If I dial back the details (clouds, mist, reflections, refractions, etc) then people note derisively that the images look too much like my early work. I aim to top myself with each and every piece. Sometimes it works and sometimes it doesn't. For my part I am disappointed that when I try to use Vue d'Esprit's most interesting features I am punished with these excessive render times. I would love to have a massive renderfarm to create these, but I have had nothing but trouble sending my scenes to render on the few computers that I have available. Vue's network rendering seems to be more attuned to working with animations (multiple cpus rendering individual frames) than working together on one frame. I really do like the Vue's output, when it works successfully, but I am starting to question whether or not I can keep using it. I just read Nelson's comments and tend to agree. Sometimes simple is best. Now that you have Bucephalus back? What happened to it. But the graininess of the water is disappointing. The water has lost the clarity of the original Atoll, which I thought was that piece's biggest strength. A number of the Vue renders over the last couple years seem to have this same grainy quality. I wonder if it is due to too many polygons rather than too few. I suppose not everyone is as distracted by the grain as I am. Can't wait for the multiscreen. A night version would be cool, but a dusk version would be even better IMO. Some shooting stars and glowing planets on that would be stellar. Worth the wait absolutely. Why is the png a different shade than the jpg? I'm just wondering where all these rendering issues will lead to? In the recent time, you have frequently mentioned extremely long processing times. Even with a new and expensive super-machine, you won't reduce the durations by more than 50% compared to Bucephalus, I think. And the programs will require more and more ressources with time, while the display resolutions keep getting higher. I find this development somewhat disturbing. Some of your newer works have got really nice details and stuff, but often I have to ask myself whether the increase of visual quality really is worth the weeks of rendering, and I don't think so. Aren't you troubled by how much dependent on the processing power you have become? Where are the "good ol' times" :-) when you could create a stunning artwork without having to render for several days? Scenes that were deep and meaningful without all that super-realistic effects? I don't mean this as an offence, Ryan; just wanted to share some of my thoughts. I stopped my desktop background auto rotation to enjoy this one for a while. "Why is 1920x1200 showing up as "untitled.png"?" I love the image. I've enjoyed and downloaded your work for years, but why is the 1920x1200 showing up as "untitled.png" when I try to download it? "Loving the Space Summer vibe..."
I really like......but I'm guessing Dual screens won't be at for a while if ever? I can't even begin to imagine the awesome tides on this beach! Hey Ryan, I really like the concept of this image, and I love the detail in the trees and plants. Obviously everyone has covered the grain issue so I won't revisit it. The one thing I might change after looking back at the 2002 image is the perspective. You used a really neat wide-angle (almost fisheye) effect for the last image that let me see so much more of the island. And while I wouldn't go that wide, this image almost feels too small by comparison, like I'm only getting a tiny slice of the island and want to see the rest. Especially in light of the gorgeous planetary vista behind it, the foreground feels a little cramped. I'm nit-picking of course. I love your work as always! "The planet is not transparent..."
Great scene. I don't have super high res monitors so being "grainy" not a huge issue, but even at 1600x1200 the water near the shore looks unrealistic. Biggest issue to me, though, is the transparent planet. I agree the water does look a bit on the grainy side, and I am to blame. I was rendering this image at Vue's "Superior" render quality but it was simply taking too long. Rather than have you guys wait another 3 weeks I decided to interrupt the image and render the remaining ~30% with a much reduced render quality. I've tried re-rendering the water with higher settings but for some reason Vue just keeps "processing" and won't even render the first pixel for over 24 hours. I will keep trying though. Thanks for the feedback! I've looked at Atoll 2002 side by side with this new image, and here're my thoughts. The 2002 version is not free from grain. Look at the water near the shore and in the detailed parts of the trees. This visual noise probably comes from the fact that whichever rendering technology Ryan used back then raytraced with only one or a small number of sub-pixels, so when you move one pixel across in the sky the colour varies smoothly. If you move one across in the trees or in the waves a long way from the viewpoint the colour varies dramatically. The water close to the viewpoint in the 2002 version is very smoothly rendered, and while less realistic perhaps it's more pleasing to the eye in my opinion. In the 2012 version the trees, clouds etc are vastly improved, and the water looks much more realistic. The grain here though goes across the whole picture, including the foreground, and the grains seem to be much larger than a single pixel. This is something that Vue d'Esprit is doing while rendering I suppose, and improving it may push the render times up even further? I love the concept and the scifi / nature landscapes you do, I find myself with quite a bit to say about this one. Grainy - agree with the comments, its very visible on the shoreline making it look fake. Plant - Does not look transparent to me its just rising and far away! Mist - I like the mist in the trees it looks realistic but the thick heavy stuff above them seems out of place with no reason for being like it is. This one was not worth the long wait sadly. I love it! Your landscapes with the planets are my favorite. Since when are planets transparent? Have to agree with Bob. I really like the concept, but the graininess It seems like, for whatever reason, several of your recent renders have looked really grainy in places. What causes that? I like the image, these otherworldly vista's are always my favourites, but the shoreline at the front of the image just doesn't look right to me, it looks grainy and out of focus, and the water also looks grainy as well, maybe its actually mist at the shoreline? This is my favorite category of wallpaper you make. Landscapes with a little sci-fi touch (Beginning of the End is another favorite of mine). Wished it could have came out sooner, but I love the end result. Strange! I uploaded the 1600 x 900 but it didn't show up until I re-ran my library script. My apologies! Did you plan on presenting in a 160x900 format as well? I like the concept, but the colors seem too bright and the image itself doesnt have the depth that your works a year ago had. It looks almost painted rather than realistic. Still, overall it's a great idea, I've just seen better from your archives. The shoreline, where the water and beach meet, looks grainy, as do the rocks on the beach. Love the concept, would like to see it touched up more. Nice. I think I'd like to see the atoll from a little higher angle though. Tides on that moon must be ridiculous. Given the standing trees, I think I'm going to assume that the moon's facing is tidal locked with the parent body... but then the rate of orbit must be incredible to have an Earth-like day/night cycle. Why must my knowledge of orbit dynamics break my immersion when enjoying this nice image? I looked at the 1920x1080. Its nice but the shadows on the planets/moons don't appear to be at the same angles. "Can't wait for the duel screen! " This one looks great. Maybe not quite my favorite but still a very nice piece of work. I'm cautious to give any feedback on what could be improved, since it will probably take a long time until we see it, but my only things is that maybe the look of the water and the shoreline could be improved, and perhaps slightly less mist would add more character. Other than that, its very well done. This render was well worth the wait. Love it Ryan!!!! "Best thing in a while"
I know everything can't be to everyone's taste but this is greatness I'm used to seeing from you. thanks love it! looks a little to soft the middle part of the pic looks like too much contrast? otherwise love the background! Atoll is one of my all-time favorites from your gallery, Ryan. I can't help but feel though that the planet should be a bit more pronounced with the clouds in the foreground like that. I can't quite put a finger on it exactly... but still it's seriously great work and it's my new desktop nonetheless. "Get me a beach chair and a drink with an umbrella"
Because I know where I want to go for vacation! Very nice but I can only imagine what lurks beneath the surface of that inviting ocean. I renewed my membership the other day and I am extremely happy that I did! I love this image! The mist behind the shoreline is certainly realistic and the sky is gorgeous. One small comment I will add is that the shoreline looks washed in a blue filter and doesn't really seem to "pop" quite like I (quite personally and probably irrelivantly) would ideally visualize. Excellent picture and already in my Win7 rotation. I love it! These are my favorite wallpapers that you create. I just love the tropical themes and you are at your best in creating them! Thanks! "All that waiting and I forgot..."
This one was set as my background before I even finished reading your Facebook post about it. Was worth the wait for sure. Lifetime membership was the best decision I've ever made and you remind me of that with each new piece. Please keep up the great work!